Talent Management is a new type of service for our Clients developed to assist you in situations where you need to plan your future workforce ahead of time. 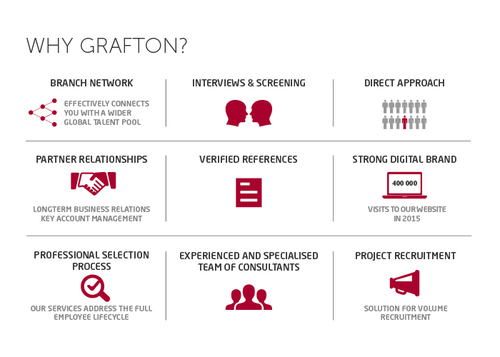 At Grafton, we understand that companies face a shortage of skilled workers, a problem that will only grow in the future. In this environment, attracting and retaining talent has become a fundamental key to remaining or becoming a competitive business. The current reality is that people do not apply for jobs; they want us to find them. Our role is to work with you to ensure that the talent you want is available when you need it. ​We advertise vacancies on all of our digital channels and local job portals in Northern Ireland and the Republic of Ireland. 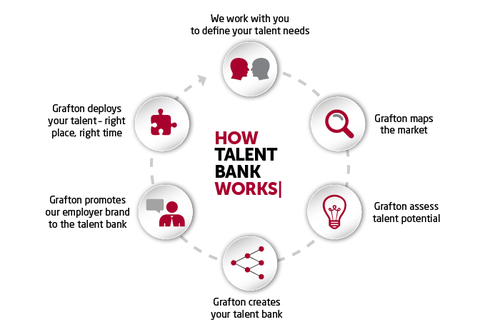 ​Regular contact with the identified candidates in the talent bank, keeping candidates informed about your company and its need (newsletters, marketing material, linked-in groups, regular communication with candidates, referrals). Our Talent Management service builds a talent pool of ideal candidates, keeping them “warm” over a defined period of time for your access. This enables you to plan and mobilise a skilled workforce over the medium to long-term for specific projects and is an ideal service for the creation of new departments or staffing entire new facilities.